There are many different types of temperature. To understand the maps of real absolute temperatures, you need to understand the types of temperature that the maps use. The following is a basic introduction to the different types of temperature that exist. There is a “normal” daily cycle of temperatures, for most locations on the Earth. When the sun rises, it begins to warm the location. As the morning continues, the sunlight gets stronger and stronger, and the location gets warmer and warmer. At about noon, the sunlight is at the greatest strength for the day. But the location has not yet reached its maximum temperature for the day. After noon, the location is still gaining heat energy faster than it is losing heat energy. So the location continues to warm, until the late afternoon (even though the sunlight is getting weaker and weaker). After the late afternoon, the location begins to cool. It is losing heat energy faster than it is gaining heat energy. The sunlight is getting weaker and weaker, and the location is getting cooler and cooler. When the sun sets, the location is no longer gaining any heat energy. It continues to lose heat energy according to the Stefan–Boltzmann law, and gets cooler and cooler. It continues to cool through the night, and gets to a minimum temperature around 6 to 7 o’clock in the morning. Then the sun begins to rise, and the daily cycle repeats again. In the past, the temperature of most locations was not monitored continuously. The highest temperature of the day (the daily high, or Tmax), and the lowest temperature of the day (the daily low, or Tmin), was recorded. An average temperature was calculated (the daily average, or Tavg), by averaging Tmax and Tmin. The daily average was not necessarily the accurate “true” average temperature, which would need continuous temperature readings for the whole day. For example, a brief period of intense sunlight on a cloudy day, could cause a high Tmax, and therefore a higher Tavg, even if the intense sunlight only lasted for 5 minutes. So the daily average, or Tavg, must be regarded as an approximation. It is often the best guess that we have for the “true” average. But it is not always accurate. Every day has a Tmax, Tmin, and Tavg, which vary depending on the weather. If we collect all of the Tmax, Tmin, and Tavg, for a month, then we end up with a collection of about 90 temperature readings (30 Tmax’s, 30 Tmin’s, and 30 Tavg’s). This is too many temperatures for most people to cope with. So some summary statistics are usually calculated. The monthly average daily high (or monthly average Tmax), is the average of all of the Tmax’s for the month. The monthly average daily low (or monthly average Tmin), is the average of all of the Tmin’s for the month. The monthly average daily average (or monthly average Tavg), is the average of all of the Tavg’s for the month. It is also possible to average each type of temperature over a whole year, to give the yearly average daily high/low/average. If we average each type of temperature over a whole year, then we end up with one yearly average daily high, one yearly average daily low, and one yearly average daily average. The yearly average daily average is a useful value. It lets you compare different locations, to see which is warmer or cooler, on average. The first map of real absolute temperatures, which was displayed in the previous article, is showing this type of real absolute temperature. The yearly average daily average, is sometimes just called the yearly average. The other types of yearly average (the daily high and the daily low), are not as useful. Because they are averaged over summer, winter, autumn, and spring, they don’t really show the temperature range that people normally experience. The give an average “fuzzy” temperature value. To see the temperature range that people normally experience, the monthly averages are normally used. So we look at the 12 monthly average daily highs, the 12 monthly average daily lows, and the 12 monthly average daily averages. – the monthly average daily high, for the month with the highest monthly average daily high. I have called this, the SUMMER temperature. It is the monthly average daily high, for the hottest month. – the monthly average daily low, for the month with the lowest monthly average daily low. I have called this, the WINTER temperature. It is the monthly average daily low, for the coldest month. This gives us 2 temperatures, which represent the heat of summer, and the cold of winter. But these are NOT the normal extremes of heat and cold, that humans experience in a year. They are AVERAGE heat and cold, NOT EXTREME heat and cold. It is very important to understand this fact. The summer and winter temperatures are AVERAGE heat and cold. In a normal year, about half of the daily highs in the hottest month, will be above the summer temperature (and about half will be below the summer temperature). In a normal year, about half of the daily lows in the coldest month, will be below the winter temperature (and about half will be above the winter temperature). You should keep reading those definitions, until you fully understand what the summer and winter temperatures represent. The summer and winter temperatures represent normal AVERAGE heat and cold. NOT normal EXTREME heat and cold. If you haven’t given up reading this article, because of all the definitions presented above, then it is time to look at the maps of the real absolute temperatures. In this article, the map will show the Northern Hemisphere Winter, and the Southern Hemisphere Summer. So this temperature map shows the Earth in January. 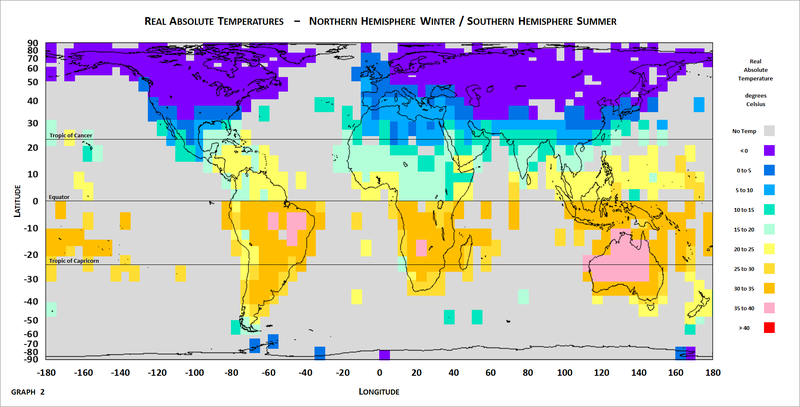 In the next article, the map will show the Northern Hemisphere Summer, and the Southern Hemisphere Winter. So that temperature map will show the Earth in July. The Summer temperatures show the normal average heat of Summer. The Winter temperatures show the normal average cold of winter. Each hemisphere is showing a different type of temperature reading. One hemisphere is showing the Summer temperature, and the other hemisphere is showing the Winter temperature. Comparing the 2 hemispheres is interesting, but they are NOT showing the same type of temperature reading. Comparing the 2 hemispheres, is like comparing apples with oranges. When you see the real absolute temperature map in the NEXT article, then you will able to compare the Northern Hemisphere Winter (this article), with the Northern Hemisphere Summer (next article). When you see the real absolute temperature map in the NEXT article, then you will able to compare the Southern Hemisphere Summer (this article), with the Southern Hemisphere Winter (next article). When you see the real absolute temperature map in the NEXT article, then you will able to compare the Northern Hemisphere Winter (this article), with the Southern Hemisphere Winter (next article). When you see the real absolute temperature map in the NEXT article, then you will able to compare the Southern Hemisphere Summer (this article), with the Northern Hemisphere Summer (next article). I apologise for the amount of reading in this article. But it is important that you understand what the real absolute temperature maps are showing. There is another important aspect to the temperature maps. Global warming is meant to be stronger in Winter, compared to Summer. Global warming is also meant to be stronger at night (the daily lows), compared to the day (the daily highs). Global warming is also meant to be stronger in the high latitudes (polar amplification), compared to the tropics. So when you look at the Winter temperatures (daily lows), the amount of warming is stronger, because they are Winter temperatures, AND they are night temperatures. Plus the high latitude temperatures include polar amplification. So you should expect the Winter temperatures to show more global warming, than the Summer temperatures. If the Winter temperatures still look cold, then you should question how big the effect of global warming is. Also, when you look at the Summer temperatures (daily highs), the amount of warming is weaker, because they are Summer temperatures, AND they are day temperatures. But the high latitude temperatures include polar amplification. So you should expect the Summer temperatures to show less global warming, than the Winter temperatures. If the Summer temperatures don’t look very hot, then you should question how big the effect of global warming is. Remember, the amount of global warming present in all of these real absolute temperature maps, is about +1.0 degrees Celsius. We have warmed by about +1.0 degrees Celsius since pre-industrial times (also called the Little Ice Age). To reach the IPCC’s +1.5 degrees Celsius temperature limit, we only need to warn by another +0.5 degrees Celsius. To reach the IPCC’s +2.0 degrees Celsius temperature limit, we only need to warn by another +1.0 degrees Celsius. Each coloured area on the real absolute temperature map, covers a 5.0 degrees Celsius range. So a +0.5 or +1.0 degrees Celsius increase, won’t change the coloured areas by much. Global warming is weak and puny, compared to the seasonal temperature changes. How many humans die from seasonal temperature changes? Which last for about 3 months. Some humans do die from seasonal temperature changes. Mainly humans who are already weakened for other reasons. How many humans will die from weak and puny global warming? There may/will be some. Probably mainly humans who are already weakened for other reasons. Do we want to abandon our high standard of living, and go back to living in caves, because of weak and puny global warming? You can do that if you want to. I enjoy my high standard of living, and want to continue enjoying it. Yes, there will be some problems from AGW. But I don’t think that it will be a catastrophe, like Alarmists are predicting. We should move towards renewable energy. But NOT destroy our valuable, reliable, cheap, fossil fuel energy sources. We need them as backup, and for emergencies. I don’t want to get bogged down in details. Let’s assume that the Sun’s influence on the tides is 50% of the moon’s. So if the moon by itself, caused tides of 1.0 metres (1.0 metre up, and 1.0 metre down), then the moon and sun together might cause tides of 1.5 metres (1.5 metres up, and 1.5 metres down). The moon is responsible for 2/3 of the tides (1 out of 1.5, or 2 out of 3). And the sun is responsible for 1/3 of the tides (0.5 out of 1.5, or 1 out of 3). So is the moon or the sun responsible for a King tide (the highest tides of the year)? Answer – the moon and the sun are both responsible for a King tide. But the moon is responsible for twice as much effect as the Sun. Compare this to global warming. Are the seasons, or global warming, responsible for the Earth’s temperatures? Answer – the seasons AND global warming are both responsible for the Earth’s temperatures. But the seasons are responsible for most of the temperature change. In comparision, global warming is weak and puny. Will global warming cause a catastrophe. I believe that it will cause some problems. But I don’t believe that the problems will be of “biblical proportions”, like Alarmists seem to think. Humans are clever (at least, some of us are). We can find solutions to the problems that global warming will cause. I like the idea of using renewable energy. If it is reliable, and not too expensive. But I don’t support going to 100% renewable energy. That would probably cause a disaster, sooner or later. We shouldn’t put all of our eggs in one basket. Or even two baskets. I want to spread our eggs over 10 baskets (because I am a pessimist. An optimistic pessimist. Prepare for the worst, but hope for the best). Don’t forget, I will publish the 3rd article, in this series of articles on real absolute temperatures, within the next week. The 3rd article will show the Northern Hemisphere Summer (the “real hot stuff”), and Southern Hemisphere Winter (not as cold as the Northern Hemisphere Winter, because of all the ocean).